We run workshops throughout the year and are happy to accommodate you are your friends or family in small parties so that you can experience our workshops. Dates through out the year please contact us for details. This is a one day workshop that will teach you incredible practices for incorporating mindfulness and manifesting into your daily lives. It will allow you to discover and let go of your conditioned beliefs and replace them tools and practices that will bring you into the awareness of the divine creator that you are. Once learned and integrated you will find that your life becomes full of inspiration, joy, gratitude, health and wonder. 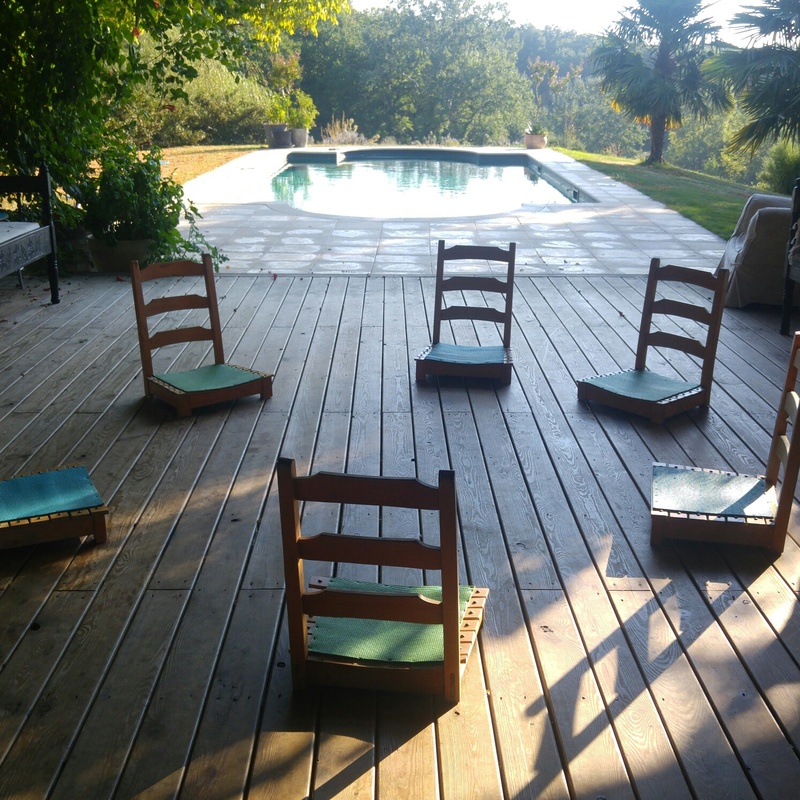 The workshop will take place at the magical SolHenge Retreat in France. The stunning private accommodation is surrounded by rolling hills filled with sunflowers and vines. It boasts a secret valley which is totally secluded, 15 acres of private woodland, a swimming pool, stunning views and our very own SolHenge stone circle. We are only one hour from both Bergerac and Bordeaux Airports. – 1 vegetarian lunch each day with home grown or locally sourced food, alfresco style dining. Reclaiming the keys to your sacred sovereignty. A weekend workshop for men and women. A journey thought the heart to the truth of who you are. Using ancient modalities from Bee Shamanism and working with the 7 directions, the elements and Gaia you will be led down alternative paths that will open you up to the infinite doorways within and thus, the road back to sovereignty of the self. With the unlocking of your true nature as a creator and your connection to souls purpose, others, the earth and universal consciousness, time will then cease to be linear. With this as a basis, a new practice of being can be illuminated. Present moment awareness will expand and become the new truth. Intensive ceremony can then be used to shut the doors to the old roads of conditioned beliefs and habits that have been holding you back (in the past time) from who you really are. At this new crossroads of potential, and with a heightened and clear perspective; tools will then be given to open, and expand the heart center so that as divine and sacred creators, connected to all that is, you can begin to manifest in heart centered awareness, carving out new paths of happiness and health from a sovereign state of being. – 3 vegetarian meals each day with home grown or locally sourced food, alfresco style dining. A day of empowerment, connection and wisdom for the modern woman. I will be offering a, one day, beginners course for women. Teaching meditation and movement practices from the ancient feminine shamanic tradition of ‘the path of pollen’. Dive deeper into the hidden layers within. Focusing ,clearing and releasing unconscious blocks and conditioning. Awaken and connect with the divine feminine. Healing self, relationships, community and planet. These practices, once learnt and embodied are life enhancing and will precipitate inner healing, a balanced state of mind and health, unity and self empowerment. The course is open to all women. A 2 day workshop for women. Unfold into the summer of your own self. Water the bud of your divine feminine wisdom; ripe and sweet with it’s longing to bloom. Experience the ecstasy of flowering as you are held by your ancestors, your fellow sisters, the spirits of these ways and by Gaia herself. Weaving the thread of self and healing for the modern woman. This is a one day course for women. Teaching breath meditation, movement practises and healing methods from the the ancient feminine shamanic tradition of ‘the path of pollen’. These practises are a follow on from the beginners’ course and will take the student more deeply into themselves. Using practises to light up the soul through discovery of the shadow self . Working with the divine laboratory of the body and ceremony. A life enhancing day of beauty, truth and magic. Dates throughout the year, please contact us for details. Spend a day bonding with your child. Take the time and the space to really connect and listen and tune into one another. A unique opportunity for you to leave the world of work, school, siblings, partners and the business of everyday life behind. And In a safe and guided space take the time to re meet your child and them you. Using guided visualisations, fun exercises, trust tasks, mindfulness, touch and listening techniques you will both walk away from this day closer and more in tune than ever before. This course is open to one parent with one child only. Children must be aged between 7 and 11yrs. €195 for one parent with child. “I attended a one day workshop with Sarita at SolHenge and it affected me very deeply. I didn’t know what to expect really, but it has sincerely changed me on many levels in ways that have helped me move forward in my life. I’m looking forward to continuing learning at SolHenge.” Clare H.
“It was my first experience of a one day course such as this, and what a wonderful and genuine experience it turned out to be.Guided and run by the lovely Sarita, who is not only expert at what she does, but also at making you feel at home and relaxed from the moment you meet her. She is full of knowledge and enthusiasm for what she teaches and lovingly shares, with her fellow students. This emanated into the entire group, until everyone was feeling relaxed and excited about the day to come. The day did not disappoint in what it brought, as Sarita guided us through the many ceremonies that created both personal, emotional, and group revelations. All of which we were encouraged to share and discuss, if we wished to.As the day progressed, under the guidance of Sarita, the group continued to form into a loving, sharing, gathering of like minded women, honouring a beautiful day in each other’s company. My experience continued on for several days and beyond. l felt both inspired and enlightened by the whole encounter. I highly recommend Sarita, she is a truly unique woman, who shares all her abundance of love and knowledge, with a beautiful passion for life and people.“ Shauna A.